Synopsis: Three WWII veterans return home to small-town America to discover that they and their families have been irreparably changed. Did You Know? Harold Russell is the only actor to win two Academy Awards for the same role in the same film. He won the Oscar for Best Supporting Actor as well as an Honourary Award for “bringing hope and courage to fellow veterans through his appearance in The Best Years of Our Lives.” He lost both of his hands in 1944, while training paratroopers at Camp MacKall, NC when the TNT he was holding exploded. After receiving hooks and training on them, he was selected to make an Army training film called Diary of a Sergeant. 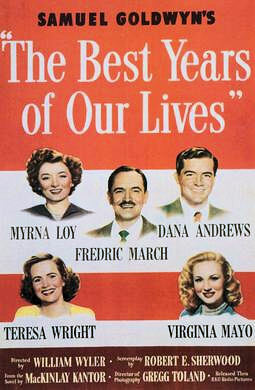 William Wyler saw the film and decided to cast him in The Best Years of Our Lives. Quotables: MILLY: You’ll probably have to make a speech! AL: It’s my plan to meet that situation by getting well plastered. Al Stephenson, Fred Darry, and Homer Parrish are our three heroes returning home from war. They are excited about it at first, but then the harsh reality that everything has changed hits them all. They have each been either physically or mentally injured, and their families have difficulty adjusting. Al turns to alcohol to cope; Fred succumbs to PTSD and loses his ambition and motivation, struggling to find a decently paying job; and the ever-optimistic Homer dissolves into blind rage and depression after being ogled like a zoo animal one too many times. It’s a thoughtful examination of the effects of PTSD and physical disability on veterans and their families.